My fascination with popovers began with a new cookbook I purchased just before Christmas. 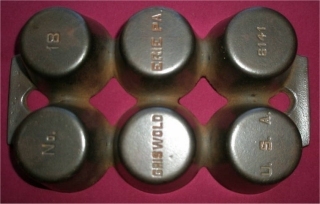 This led to a search for the perfect popover pan, which turned out to be antique Griswold cast iron. That, in turn, led to intensive research on how to restore an old cast iron pan covered with rust and crud. I succeeded, as you can see in the picture below. In this post I’ll describe how to restore a cast iron pan, and then use it to make perfect popovers. My first popover efforts used pyrex cups. It worked pretty well, but I wanted to see if I could get them to rise even higher in cast iron, the “gold standard” in popover pan perfection. 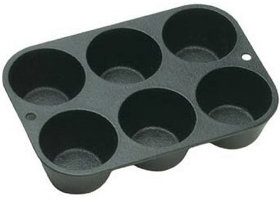 Lodge Logic makes a cast iron popover pan, but it doesn’t have the space between the cups that I read is important. 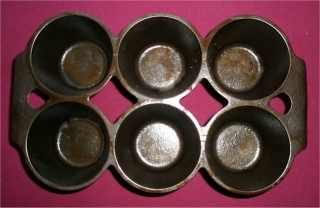 So I turned to eBay and found an antique Griswold popover pan that was perfect. 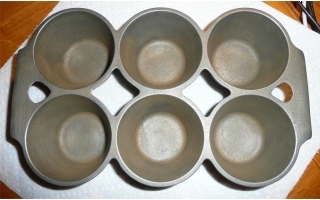 It was no big surprise that the perfect popover pan would be a Griswold because old (pre-1940) Griswold pans are widely considered to be the best cast iron cookware ever made, and are highly collectible. I could see from the listing pictures that there was rust under the seasoning, but I couldn’t see any significant pitting so I thought I could restore the pan to usable condition (though, admittedly, I had never done such a thing before). When I received the pan, I found it had a fair amount of crud on it, and felt a little sticky from a bad seasoning job. The ideal way to clean cast iron is through electrolysis, which cleans off both crud and rust. An electrolysis setup involves a car battery charger, a large plastic tub, stainless steel pipes, and good ventilation – none of which I have in my tiny NYC apartment in the dead of winter. And even if I did have these things, I’d be afraid of doing something wrong and blowing myself up. Another good method is a self-cleaning oven, but there are some risks. There have been reports of the crud catching on fire inside the oven, which is locked during the cleaning cycle so you can’t open it and put out the fire. There is also a risk of warping the pan at self-cleaning temperatures, which are 900-950°F. Most of the time, neither of these bad things happen and it works great, but I don’t have a self-cleaning oven. Next best is a lye bath, which cleans off crud and old seasoning, but not rust (that requires a second step). That was also a no-go for me due to the lack of a plastic tub, and my general fear of substances that could explode and kill me. But oven cleaner usually contains lye, and I thought I could handle oven cleaner. I put some cardboard down in the bathtub and laid the pan on the cardboard. Before spraying thoroughly on both sides, I suited up like an astronaut – long rubber gloves (double, thin latex underneath, in case there was a tear), double mask over my nose and mouth (one isn’t enough – you still breath vapors), and goggles over my eyes. This is not excessive precaution. I somehow got a drip of oven cleaner on my upper arm and it burned right through my skin. I flushed it very thoroughly in water and then dabbed on some yogurt since lye is base and yogurt is acid – that soothed it. After thoroughly spraying the pan with oven cleaner, I popped it into a large, thick plastic bag, closed the bag tightly, and put it in a small plastic wash tub in the general vicinity of my radiator so heat could help it along (not on the radiator, of course, just near it). I waited 24 hours, then donned the gloves again and took a look. A rinse and a scrub told me it needed another dose. I again suited up like an astronaut, sprayed it down again, and put it back in the sealed plastic bag near the radiator. Twenty-four hours later I looked again, and this time all the crud was gone. But the pan was covered in thick rust that went way beyond my scrubbing ability. I didn’t take a picture of the bottom of the pan, but even the letters on the bottom were encrusted with rust. When you put a pan in a vinegar and water solution, it sort of simultaneously rusts and derusts. The vinegar will cause the excess rust to lift off the pan and bubble up, but when you take it out of the solution it instantly starts rusting because the iron is utterly unprotected. A very thin film of rust is unavoidable – you just oil the pan and wipe it off that way. Don’t leave the pan in the vinegar indefinitely waiting for it to come out perfectly gray. It never will. You want to leave the pan in the vinegar for the shortest time possible, so check it frequently, and never leave it in the vinegar solution for more than 24 hours. I checked the pan every couple of hours. At about the 12 hour mark I dumped out the rusty solution and put in new, clean solution. A few hours later, no more rust was bubbling up from the pan so I figured it was done. I removed it from the vinegar solution and scrubbed it down with washing soda (like baking soda, but much stronger) to make sure the vinegar was complete neutralized. Washing soda is base; vinegar is acid. Then I put it in a 200 degree oven to make sure it was bone dry. When I took it out, I oiled it all over with avocado oil. I’ll explain the reason for avocado oil in the next section. I want to emphasize how important it is at this point to rinse all the vinegar off using washing soda to neutralize, thoroughly dry the pan, and then thoroughly oil it. Do not wait even 10 minutes to do this because the pan is already rusting and you must stop the process. Rub the pan really well all over with oil – especially in crevices – to wipe away the surface rust. Change paper towels frequently! You’re cleaning it with the oil. When you stop seeing rust on the paper towel, you can start seasoning. Note that you’ll still see dark residue from the iron before the pan is seasoned – that’s normal. 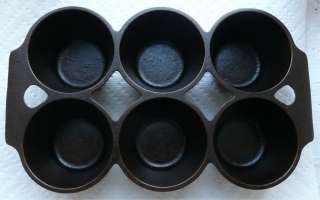 Notice how the pan is a medium gray, and not the black usually associated with cast iron? That’s because you’ve cleaned it down to the metal, which is gray. It’s the seasoning that makes it dark. That comes next. It protects the iron from rust. It makes for a glassy nonstick surface that’s better than any commercial nonstick surface, and far better for you. When you start to research how to properly season cast iron, you quickly realize that no one fully understands the science behind it, and advice is based on folklore and superstition. Do you use solid fat or liquid fat? If liquid, should it be polyunsaturated or monounsaturated? Should you bake it at high temperature or low? Should you heat it above the smoke point of the oil you use, or below? You’ll find ardent supporters of all these practices on the internet. I can’t say that the method I used is the only way or even the best way, but I did end up with a beautifully seasoned pan, as you can see. Compare these pictures to the ones above with the purple background, before the pan was cleaned. Much better! It seemed to me that the important factor here was polymerized fat. That’s what’s so hard, glassy, and slick. The black color (as opposed to deep brown) comes from burnt material – carbon – bound up in the polymerized fat when you bake the pan above the oil’s smoke point. I didn’t like the idea of doing that because heating oil above its smoke point releases free radicals, which are carcinogenic. That’s why you never ever want to heat oil above the smoke point when cooking. I liked the idea of a monounsaturated oil because it doesn’t go rancid. You don’t need to refrigerate olive oil, which is mostly monounsaturated. And I thought that high oven temperature made more sense than medium or low for creating a hard glassy surface rather than a sticky surface. Putting all that together, I decided to use avocado oil, which is monounsaturated and has the highest smoke point of any edible oil (see this chart of smoke points). Avocado oil doesn’t smoke until 520°F. If I had a decent oven I’d have baked it at 500°F, but unfortunately my oven only goes up to 450°F, so that’s what I used. Coat every surface of the pan with the oil and then wipe it off with a paper towel so it’s very thin. You do not want pools of oil on your pan or they will stay forever sticky and you’ll have to strip it back down with the lye and start again. After oiling, put the pan face down in a cold oven (face down so as little surface is touching the rack as possible). Put a pan or some foil below the rack to catch any drips, but it should not be dripping much if your coat of oil is sufficiently thin. Then turn up the heat to 500°F (or as high as your oven can bake). When it’s done preheating, set your timer for an hour. When an hour has passed, turn off the oven and leave the pan inside without opening the door until it’s cool enough to handle. That takes at least two hours. Then take the pan out of the oven, and rub it with oil and bake it again. And again. And again. And again. And again. And again. You need at least six coats of seasoning because each coat must be very thin. You can’t speed this up. If you use too thick a coat of oil, it will never get hard and you’ll have to strip it all off and start over. After six coats I started to wonder if the glaze would ever be sufficiently thick, so in frustration I added two coats using a different technique. Instead of avocado oil, I oiled the pan with strained drippings from some bacon I bought at the Farmer’s Market – no nitrates or other chemicals in it. Again I wiped it out with a paper towel so it was very thin, but saturated fat (fat that’s solid at room temperature) always goes on thicker than liquid fat. I then baked it for two hours at 350°F and let it cool down in the closed oven. When the pan had cooled, I opened the oven door and put a finger on the pan. It felt a little sticky, so I closed the oven door and cranked the temperature up to 450°F, leaving the pan in the oven while it preheated. When the oven was at 450°F, I set the timer for an hour, then turned off the oven and let the pan cool down in the oven. When I took it out, it had a thicker glaze on it and looked quite nice. I went one more round with the strained bacon fat (organic! no nitrates!). The second time I baked it for one hour at 350°F, and then two hours at 450°F, letting it cool down in the closed oven. When I removed the pan, perfection! Why start with the lower temperature when seasoning with bacon grease? It prevents smoking. I don’t know why, but it does. The smoke point of lard (pork fat) is 370°F. Baking it at 350°F changes it somehow so when I raise the temperature it doesn’t smoke. If you season a pan with lard without this first lower-temperature step, it will smoke like crazy. Reports on the internet warn you to open windows and door, turn on fans, etc. None of this is necessary if you bake it at 350°F first. I’m not sure whether my pan got so lovely and well-seasoned after the bacon grease because it already had six coats of avocado oil on it (it did get darker with each application), or the bacon grease has some sort of special qualities. I’m about to season a skillet, so I’ll soon find out. Next time I’ll start with the bacon grease and see if I can get it to the beautiful point with fewer layers. I was starting to worry I’d wear out my oven (not to mention the damage to my electric bill). All of this was in quest of perfect popovers, so here is my popover recipe. I like to keep it very simple, just four ingredients: milk, egg, flour, salt. I’ve tried a little melted butter in the batter, but it rises less that way and I don’t find I need it for taste. I make it in a 2-cup pyrex measuring cup. Preheat the oven to 450°F. While that’s happening, pour ½ cup of milk into the measuring cup and crack in one egg. Beat that with a wire wisk. Add the salt and beat some more. Measure out ½ cup of flour and dump that in. Wisk it together until it’s smooth, then as soon as it’s smooth (no lumps) stop mixing. Don’t overmix it. Let the batter sit while the oven continues to preheat. If you’re using cast iron rather than pyrex, rub avocado oil into the popover cups. At some advanced point when the pan is excruciatingly well seasoned this won’t be necessary, but for now it’s necessary to keep the popovers from sticking and it also serves to add seasoning to the pan. 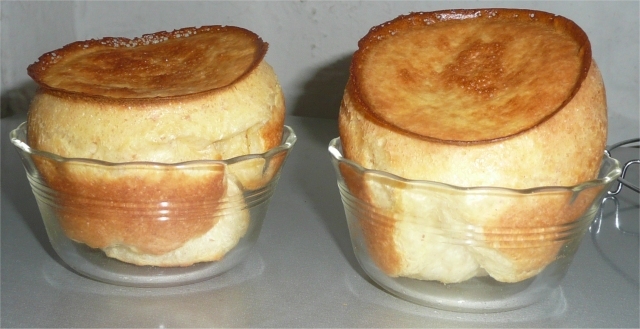 When the oven is preheated, put the popover pan into the oven to heat empty for five minutes. 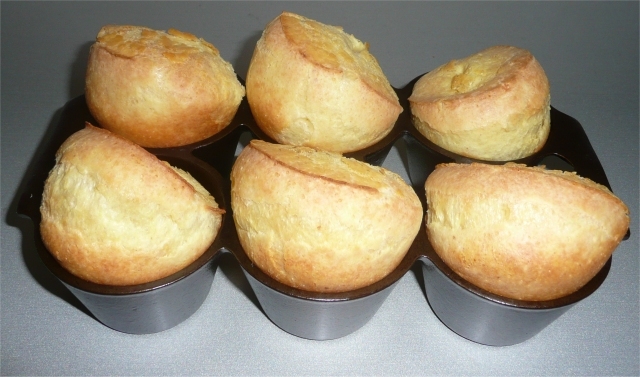 Your popovers will pop higher if the pan is preheated. You do this with oil rather than butter because the butter will burn. As soon as they’re out of the oven, pull them out of the pan (they should slide right out), put them on a cooling rack, and stab them with a small knife to release the steam inside so they don’t get soggy. I like popovers for breakfast with butter and jam. They’re also good as sandwich bread for lunch. When they pop really high they’re hollow inside, and you can fill them with tuna salad. So does cast iron make a difference? 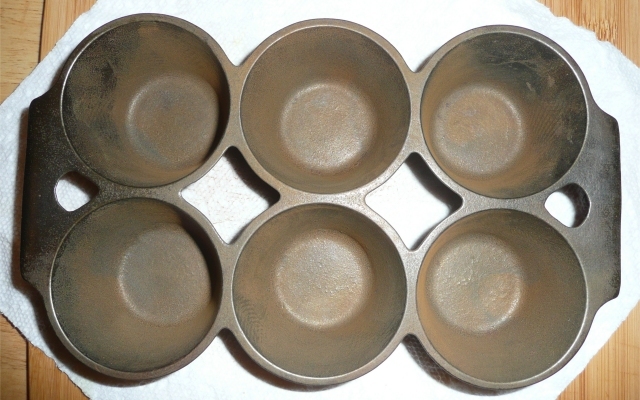 Popovers made in pyrex are perfectly good, but the ones made in cast iron are crispier on the outside and pop higher. And I enjoyed learning how to clean and season the pan. Do you have opinions – preferably science-based – on seasoning cast iron? Liquid or solid fat? Smoke or no smoke? I’d love to hear other people’s experiences with this. 1/4 c pan drippings or vegetable oil. I would follow the same baking procedure, temp and time that you suggest above. My new (to me!) 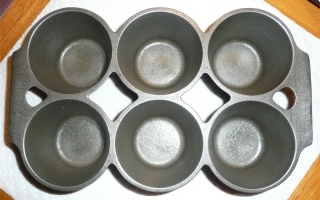 Griswold popover/muffin pan is now on its way from ebay. It will be the next candidate for cleaning and seasoning. 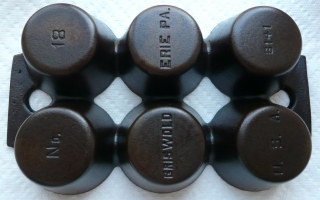 I especially want to thank you again for these excellent posts on cast iron. I never would have purchased a skillet in the condition mine was in if I had not already read your posts! But I took the chance, and I am thrilled! Thank you! Awesome blog. I’m using the techniques now and they are working well. 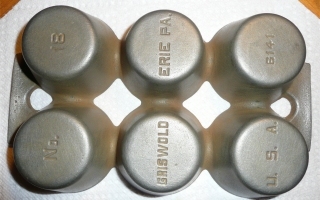 By the way what did you pay for the Griswold popover over pan? Thank you for this information and for sharing it. I plan to put it to good use next week. I wanted to say, to those that are having the smoking problem during the seasoning, that we have been putting our CI griddle on our propane grill and shutting the lid. It has a temperature gauge on it so we can get it to 475+ and then I just let it go for an hour. I sit in the kithen and watch the smoke and, well, just let it smoke. Also, we live in AZ so I plan on putting the oven cleaner on the griddle, inside the plastic bag and setting it outside in the heat. I’ll see if it is hot enough to do the job. Thanks for the information. I have two CI frying pans over 40 years old. I use all the time. I just use wadded up foil to “scrape” the gunk out of the pan, rinse with water, no soap, then dry with a paper towel. I usually use some type of oil to spread a thin layer on the pan and store it in the oven. If I need to use the oven, I pop it out, then put it back in when I am done, even if the oven is warm. I have not had to re-season the pans for several years, maybe 10. But, they are getting a little scraggly looking so will scrub them up and season with flaxseed oil. I always have some on hand. I hope to get a smoother finish than I ever have, sometimes I do get a little sticky if I wipe too much oil on the pan. Thanks for all the research and information. I’m probably as detailed as you are when it comes to my cast iron pan’s cleaning. Thank you so very much for posting all this info online! I have two chicken fryers (Griswold and a Wagner), for the last 30+ years, and use one for salty foods and another for sweets and caramels. I’m glad you mentioned the avocado oil. I’ve been using almond oil on my sweet pan and peanut oil on the salty one. Both my pans are better than the slickest Teflon around! Thanks again for the awesome article! About the electrolysis. You never use stainless steel in electrolysis because it can cause hexavalent chromium to form. 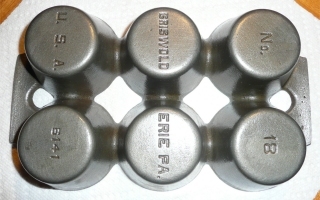 Stainless steel contains chromium. Chromium in that form is highly toxic and is proven to increase the risk of many serious types of cancer. do I mix the soda with water during this stage? can I use the flax seed oil for oiling it after drying it in the oven? Thanks. Any response will be appreciated since I am doing this to my pan right now. Thanks. In lieu of using oven cleaner, you can use lye crystals to make a base bath in your sink and soak you pans that way. I found that the fumes of oven cleaner were irritating and an annoyance. Thanks so much for your site, Sheryl! I have a few Lodge pieces (if I weren’t in college and could afford more, I would certainly have a kitchen full). My Lodge pieces have done me well for about 2 years but recently it has become apparent that they needed to be stripped and re-seasoned. Your tutorials are FAR more detailed and helpful than the brief, vague paragraph offered by the manufacturer. Thanks again for your help! I was given a counry cabin 12″pan with the thumb rest. It had a stain on the bottom.I put it in a camp fire untill the pan was glowing red hot…..it did not warp. The stain is gone. I used a wire brush and steel wool to get off all the rough spots. I am trying to get the red color out of the metal. The onion just made me cry and didn’t work. I tried the grape seed oil it smoked and burned off –left another burn stain. Now i am trying the flax at 200 degrees. I have made it all the way to the avo oil cleaning and have been wiping and wiping, but I am still getting black on my paper towel! Is this okay or should I do another vinegar bath? Keep wiping?? Stop and continue with the next step? My pan was very rusty to start. Thanks for all your help!!! I am closing this post for further comments.